Demon hunter. Chimera killer. Dragon Slayer. Titles that bring honour and glory... But to claim one of these awe-inspiring titles, heroes must defeat these beasts. Many adventurers have dreamed of slaying a giant wyvern and plundering its ancient hoard, but dragon-slaying is no easy task! Horrifying and deadly monsters lurk in the forests, swamps, and jungles of Aventuria. Heroes are little more than food to creatures such as these, and the unwary might fall prey to venomous fangs, razor-sharp claws, or worse. 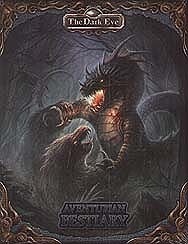 The Aventurian Bestiary introduces 40 terrifying monsters and two dozen highly dangerous animals to challenge even the mightiest group of heroes. This sourcebook also describes supernatural beings such as demons, fairies, and ghosts, and nightmarish, flesh-and-bone creatures like the corpse-devouring ghoul, the foul pit worm and the titanic gorger. The wilds of Aventuria are home to more than just monsters. Aventuria's oceans, skies, and fields support many dangerous and interesting animals such as bloodthirsty striped-sharks, arrow-swift storm falcons, and heavily-armoured horned saurians. Each presents a unique challenge for heroes who dare to explore the trackless wastes. Each creature description features a full stat block, a colourful illustration, and notes of physical traits, habitat, and encounter tips. As a bonus, the Bestiary introduces new rules for swarms, new diseases, new advantages and disadvantages, new creature special abilities, new creature types, and expanded rules for hunting and making use of quarry.